Maundy Thursday Quiz – get your team ready! 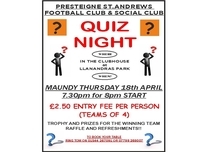 Presteigne St Andrews FC will be holding the annual Maundy Thursday Quiz on Thursday, 18 April. 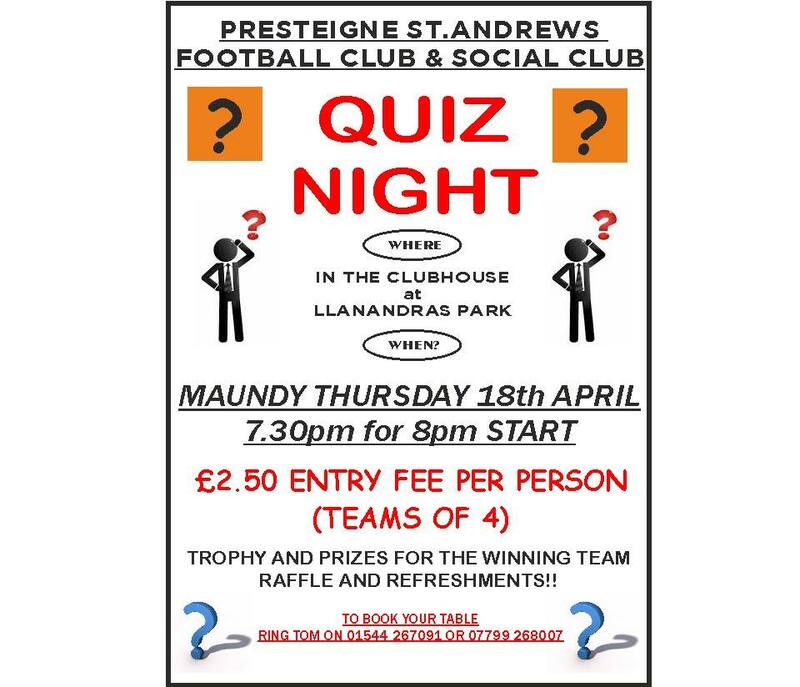 This is the perfect way to start the Easter break so why not get your team of four together and head down to Llanandras Park to exercise the grey matter? The cost of entry will be £10.00 for a team of four and this will include refreshments. A bar will also be available although – just to be crystal clear from the outset – your £10.00 does not include your drinks! So, if you are looking for a good night out safe in the knowledge that, for most of us, the following day will be a public holiday, then this is the place to be. The Quiz is due to get underway at 8.00pm, but teams are asked to start arriving at 7.30pm in the hope we can get off to a prompt start. To book your table for the quiz, please contact Tom Ammonds on 01544 267091 or 07799 268007.